I started putting together the 2nd necklace yesterday morning (considering the still unfinished experiment the first). 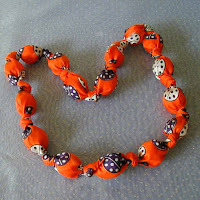 By the time I finished, it was apparent that not all knots are created the same and it was going to take some practice. So, took it apart and started over ... twice ... until I started making the knot in a consistent manner. Decided I like the knots on the looser side and that I need to work from one side to the other versus starting in the middle and working on each side separately. The first one is made with the balls all the way around and the scarf is stitched together at the very edge. 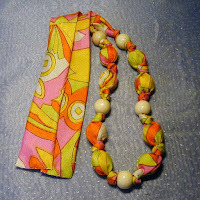 I used some wood beads as variation on the second one; hand stitching the tie ends closed. I'm liking the way these are turning out. Each one is a surprise ... how the pattern falls. I've listed the first two Artfire Shop. I've got two more that I've inserted the balls that I'll finish off tomorrow.